While the solar industry has seen a huge surge in recent years, the uptake of technologies other than PV panels has been minimal. Despite the National Solar Mission attempting to catalyze the Concentrated Solar Power segment, the uptake has been quite limited till date. Varying reasons from lack of proven technology to size related challenges and inefficiency are typically cited by the industry players. 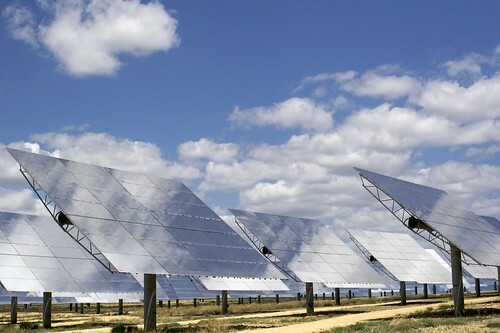 Micro CSP is an innovative breakthrough which claims to be more efficient and much smaller than conventional CSP technology. The idea of micro CSP is such that it utilizes the concept of large scale concentrated solar power and then shrinks it down to about a quarter the size. Micro CSP technology uses mirrors to reflect heat on a pipe carrying a heat transfer liquid. These parabolic curved mirrors commonly known as collectors are 12 feet long and weigh less than 200 pounds. It’s thus much easier to install micro CSP in, say, roof tops. The heat generated through concentrating sunlight can be used for a variety of things- from generating hot water, to process heat or to run an absorption chiller for air conditioning. Like conventional thermal power plants, it can also be converted into saturated steam to generate electricity using turbines. Micro CSP is specifically directed towards distributed generation of 250kW – 20 MW. CSP does have a lot of challenges with respect to the fact that its deployment requires a lot of land and water – a constraint that is felt in most regions. However, Kimura says, “Micro CSP is better suited to address these challenges. I think micro CSP for industrial heat or steam is going to emerge as a huge market”. Kimura says his customers are typically manufacturing and processing companies that use boilers and traditionally burn fossil fuels to create heat for melting metals, pharmaceutical industries and the whole range of industries which require heat for their operations. Large scale deployment of alternative solar technologies will require a push in the right direction from governments in the form of tax credits and rebates. “Policy interventions like carbon taxes will go a long way in making conventional sources of energy more expensive and paving the way for CSP to become more economical”, Kimura added. Drawing lessons from across the world and in India, it is evident that CSP has as much of a battle to fight with coal and oil as much as it has with PV. Even though the first phase of the JNNSM had equally distributed targets of 500MW for both PV and CSP to meet its target of 1000 MW generation by 2013, PV has obviously done much better in meeting those targets with most CSP projects having been delayed and/or shelved for myriad reasons. Micro CSP seems to be a viable alternative to CSP and might find a niche consumer base in the increasingly big solar market in India. With definite advantages over conventional CSP in terms of size, water usage, scalability and the larger opportunities offered by process heat, the SME sector in India, especially, might have much to gain by Micro CSP technology.